I’m really taken with Courtney’s wildlife drawings. She captures the Great Horned owlet’s character so wonderfully here! Thank you Courtney for another great sketch! A hard and fast “punch” is delivered at the entryway to the burrow of a little critter that will become the coyote’s prey. It’s part of the cycle of life. Coyotes sometimes use their two front paws which they stiffen for this purpose. In this case, the nose is used to deliver the hefty punch. From what I have seen, this punch disables or weakens the critter. Most of the time, as here, it is followed by probing and digging before the prey is actually captured. The coyote regularly looks around to check out the safety of his surroundings. I, too, heard the loud rustling sounds of a squirrel which caused me to look over and see it. The coyote’s attention became more and more intent the more he watched the loud activity. Finally, the coyote stood up, then dashed over to the tree. But no squirrel was in sight. “Could I have mistaken the tree?” Just in case he got it wrong, the coyote inspected the next tree over, but the squirrel was not there either, apparently. So Coyote settled for a green grassy salad close by before trotting off. Chicken Drama, But No Drumsticks! This was an exciting day! Many people keep chickens in their yards these days: chickens are allowed, but not roosters because they crow. But guess what — it is not just the roosters who crow! So crowing is what I heard, and so did this coyote as he passed through a neighborhood. The coyote approached the very well fenced-in yard — there was no chance of him getting in. However, the chickens saw the coyote through the wire fencing and began shreaking and flapping. One flew to the top of the fence where she strutted for a few minutes, and then she flew out of the protected yard into a tree in the overgrown yard next door. I thought: Oh, no! The dog did his duty by barking at the intruder, but he was fenced in and that is all he could do, so he left. The coyote walked over to under the tree where the chicken had flown. And he waited. And he waited, hoping the chicken would descend to a more reachable level. The chicken crowed continually the entire time, but never budged from her high perch in the tree. And the coyote waited and waited. I wondered if the chicken would make it back. She did. She suddenly flapped her way back after about 35 minutes. As she did so, the coyote jerked to a standing position, but remained where he was, watching. Maybe chickens are smarter than we think. My thought is that this chicken had flown out of the coop to distract the coyote from the other chickens. She stayed out there scolding that coyote. When she realized the coyote could not reach any of them — which the coyote would have done by then — she flew back to the safety of her yard. Eventually, the coyote walked off. He knew the chickens were not reachable in their yard. There was lots of drama, but no drumsticks this time! Urban life has a lot to offer, including a greater variety of menu offerings that can be found right down the street or around the corner. This meal must have been delicious — the coyote licked the bowl and spoon clean after first eating a tortilla chip. Then he looked up and down the street for more signs of food. There not being any, he trotted off into the woods. Although these were tossed-out-the-window leftovers, there was enough there for the coyote to appreciate the taste, and maybe to decide he would like more. This kind of treat is only ever found in areas of human activity. I’ve seen coyotes wander into picnic areas after hours where they pick up bits of food which cannot be found in wild habitats. Aren’t we trying to keep coyotes from frequenting human activity areas? By dumping our dirty paper plates and leftovers wherever we please, we are actually inviting these critters to come out into the open more. A flock of ducks passed overhead and I watched it across the entire skyline. A coyote I had seen not too far off also had stopped its activity to observe the same sight, raising its head and fixing its gaze on the arcing flight of birds. We both stayed there watching until the birds were no longer in sight, and then continued what we had been doing before we saw them: me, watching the coyote, and the coyote hunting. Coyotes are as curious and as interested in their surroundings as we are. I frequently see them watching simply to see what is going on. 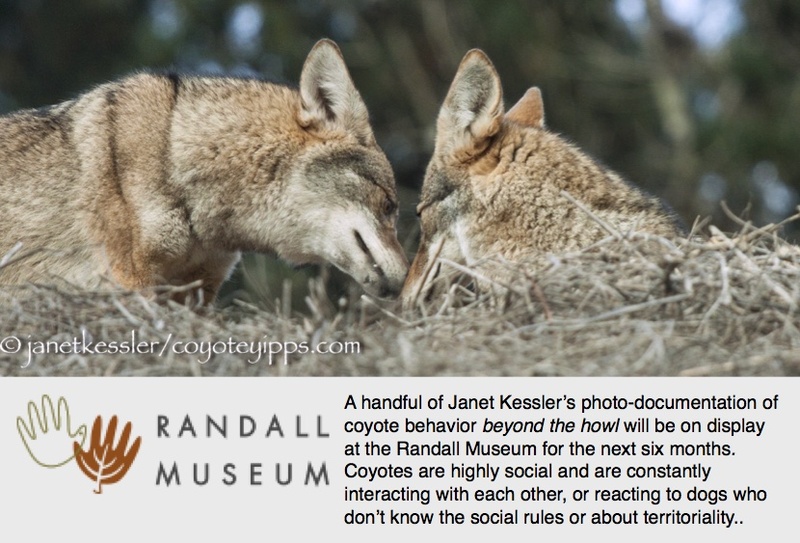 I felt “connected” to have shared the same awareness as a little wild coyote had.